F-15s, F-16s, F/A-18s and A-10s from around the US have migrated west to join the Hawaiian Air National Guard's F-22 Raptors for exercise Sentry Aloha, where they will all train to fight and win as an integrated team. Hopefully, they'll also get a chance to drink something out of a coconut. "Sentry Aloha provides a pivot to the Pacific, combining fifth-generation, fighter integration training with large force employment to provide joint, total force integration between the HIANG, Air National Guard, USAF, and other DOD counterparts in a current and realistic war fighting capacity." Sentry Aloha is a big undertaking, with about 50 aircraft and 1,000 airmen from around the US participating in the war games, with KC-135s and C-130s taking on key support roles alongside their fighter brethren. Of special note is that the exercise saw two of America's five premier homeland defense F-15C/D units attending, the 123d FS "Redhawks" out of Portland, Oregon, and the 159th FS out of Jacksonville, Florida. "Everyone participating and supporting is professional and well-trained. The biggest challenge is the enormity of coordination required to execute complex missions and the many moving parts involved. Sentry Aloha is hosted by the HIANG but to be successful at this level the HIANG relies on cooperation and support from the entire Ohana: Pacific Command, Pacific Air Forces, FAA, and many other agencies to make it all work. Success is directly related to the HIANG's ability to properly coordinate and include all players in all phases of the exercise." Since the Hawaiian ANG gained the F-22A Raptor, with all of its unique capabilities, and as a result of the Department of Defense's increasing focus on the the Pacific region, Sentry Aloha has never been as relevant or important as it is today. Additionally, as higher-end fighter aircraft proliferate throughout the globe, and countries like China rush to reach near technological parity with the US, fighting with and against dissimilar but very capable aircraft makes everyone involved better at their jobs. "What's going on is a lot of our potential enemies and near peers have invested in that same force. They learn from us, they watched us and are now starting to invest in the way that we are. So while not commonplace at all now, large air wars will be potentially an integral part of a future war, a major battle." "Fighter dogfighting hasn't happened on a scale that we see in these exercises — and that's a good thing. There are a lot of folks that just simply don't want to tangle with us in that way." Sentry Aloha is one of a small handful of large force employment (LFE) training events put on by the Air Guard across the US. This year, those exercises include Sentry Savannah, which recently wrapped up in Georgia and included F-16s, F-22s, T-38, F-15s and even F-35s, as well as Sentry Eagle, which will take place at the USAF's F-15C/D training hub in Klamath Falls, Oregon, later this summer. The seemingly rapid increase in realistic large-scale, multi-unit training is a result of a much smaller air force that gives the same units more elaborate training opportunities each year than ever before. 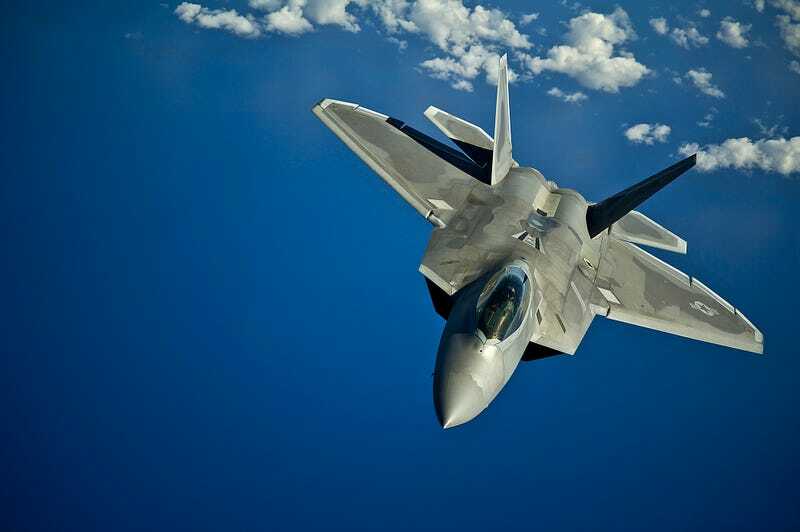 Additionally, because the USAF only ended up with 184 F-22As, developing the methods, and training based on those methods, to integrate the unique aircraft into a force dominated by older non-stealthy combat aircraft has been a very high priority. The change in global geopolitics, namely the awakening of the "Russian Bear," and the end of sequestration that saw the majority of large force employment drills cancelled for over a year have also worked to accelerate complex air combat training opportunities. Although these exercises are all fantastic at facilitating a more integrated and highly trained Air Force, none of them work as a regional deterrent like Sentry Aloha does. Having the Raptor stationed in the middle of the Pacific is already a heavy reminder to America's would-be foes of what they would face should hostilities boil over, but showcasing the 154th Wing's high state or readiness and ability to work with 4th generation jet fighters that still make up the foundation of the USAF' combat capability takes this deterrent to a whole other level.